Probiotics Gold is formulated with 5 billion CFUs of beneficial probiotics to help support digestion, immunity, and other aspects of health. The beneficial microflora in Probiotics Gold are delivered all along the intestinal tract with the patented BIO-tract® controlled, targeted release delivery system. The LiveBac® tableting process ensures extended shelf-stability at room temperature. 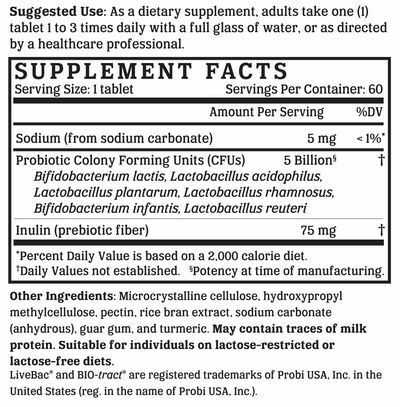 Probiotics Gold is manufactured in the USA to industry-defining quality standards and is verified by independent third-party labs to meet purity and potency label claims. The human body plays host to millions of microbes on the skin, in the mouth, and all the way through the GI tract. More important than the numbers and types of microbes that colonize our bodies, are the dynamic interactions that these microbes have with our bodies. With the exception of oral probiotics that are useful in maintaining tooth and gum health, all other probiotics must survive the digestive tract and reach the small and large intestines, where they are needed the most. Unprotected, the vast majority of live probiotics that enter the stomach won't survive to reach the GI tract, where they aid in the digestion process and help replenish beneficial bacteria that can support healthy immune function. We like to make supplements that can be enjoyed by everyone. That's why our products are always compliant with the best practices for avoiding allergens and minimizing cross-contamination. Probiotics Gold is free of soy, gluten, egg, milk, peanut, shellfish, and corn allergens. Consistent with our guiding principle to “do no harm,” Probiotics Gold is manufactured without the use of additives or preservatives. It contains absolutely NO contaminants, pesticides, herbicides, harmful additives, residual solvents, magnesium stearate, or hexanes. Like all NutriGold products, Probiotics Gold is subject to over 140 purity and potency assays by independent, third-party labs to ensure that the product meets or exceeds its claims. So, you can be certain that what's on the label is what's in the bottle. Nothing more, nothing less.